The Government of Kenya is committed to promoting interventions on sustainable development in line with various global and regional frameworks. The country endorsed and adopted Agenda 21 that emerged from the United Nations Conference on Environment and Development (UNCED) in Rio de Janeiro in 1992 (UN, 1992). The UNCED recognised that achieving sustainable development would require the active participation of all sectors of society and all types of people. The Johannesburg World Summit on Sustainable Development (2002) re-affirmed the objectives of the UNCED and the Millennium Development Goals (MDGs). Further emphasis on need for enhancing interventions was reiterated during the World Summit on Sustainable Development which was held in Rio de Janeiro in 2012 which gave rise to a roadmap document referred to as “The Future we Want”. Kenya has domesticated global frameworks and conventions that support Sustainable Development into its Constitution and other legislation. Kenya promulgated her Constitution in 2010 and Article 10 describes sustainable development as a national value. Further, Article 42 and 69 makes it an obligation for the government and the citizens to protect the environment. In addition, Article 53 entitles every child with a right to free and compulsory education.The adoption of SDGs gave impetus to Kenya’s engagement with the need to actualize SD as a national goal. To this end diverse legislation and policies have been enacted to spearhead realization of sustainable development. In order for the country to achieve SDGs, the Government has developed a Green Economy Strategy and Implementation Plan (GESIP) to support development efforts towards addressing key challenges such as poverty, unemployment, inequality, environmental degradation, climate change and variability, infrastructure gaps and food security among others. In addition Kenya’s Vision 2030 is the government’s principal document guiding socio-economic and political development. Vision 2030 document aspires to revitalize the country’s economic growth through harnessing of its natural resources. Education is identified as a key driver under the social pillar. The inspiration was to have an ESD policy developed and all education interventions reoriented to address ESD. Vision 2030 and GESIP have identified ESD as an effective strategy for building capacities to undertake a transition to a green economy in Kenya. The Environmental Management and Coordination Act, Cap 387 is a framework law that provides for effective coordination and regulation of all actions that have a direct influence on the environment. Section 42 (4) of the Basic Education Act stipulates that ‘the Cabinet Secretary of Education shall upon advice of the National Education Board advise the government on the promotion of environmental protection education for sustainable development’. The 2013-2018 National Education Sector Plan (NESP) provides a strategy for education and training to promote ESD with reference to the Global Action Programme. Sessional Paper No. 2 of 2015 on Reforming Education and Training in Kenya envisages a curriculum that is competence-based to foster quality education in the country (Republic of Kenya, 2015). Through this policy, the Ministry of Education is committed to promoting ESD as a key element to enable sustainable development and quality education. ESD activities in Kenya have been implemented within an overall framework of the UN Decade of ESD (2005-2014) and the Kenya ESD Implementation Strategy (2008). The ESD Implementation Strategy has guided ESD interventions through eight interlinked strategies of advocacy and vision building, consultation and ownership, partnership and networks, capacity building and training, research and innovation, use of ICT, monitoring and evaluation, and Regional Centres of Expertise (Republic of Kenya, 2008). Further, the country has developed a national ESD policy (Sessional Paper No. 11 of 2014 on National Education for Sustainable Development Policy) spearheaded by the Ministry of Environment and Natural Resources. The policy provides mechanisms for engaging all stakeholders in addressing sustainable development challenges through education. Kenya’s Public sector engages with SDGs as a directive from the Central Government through mandatory Performance Contracting. The Kenya Gazette Notice Number 2431 and Legal Notice Number 93 of August 2004 set regulations and performance contracting in public service and State Corporations in Kenya. All public sector executives are obligated to sign performance contracts with the central government. Implementation of SDGs is managed by two institutions namely the 1) Ministry of Devolution and Planning and 2) the National Environment Management Authority. Each institution is expected to report to NEMA and Ministry of Devolution and Planning simultaneously. There are many similarities in demands from both institutions. However it is critical to note that NEMA’s process has a lot of bias on addressing Environmental Sustainability issues while the Ministry of Devolution process is more broader and include social and economic aspects which may have escaped NEMA’s interest. These expectations imply that Kenya takes implementation of SDGs seriously and has cascaded their implementation to diverse institutions. These institutions will be in a position to implement all the SDGs since their collective interventions spread over all aspects of SDGs. NEMA has further explained the steps to be taken by the institutions as they implement Sustainability targets above. 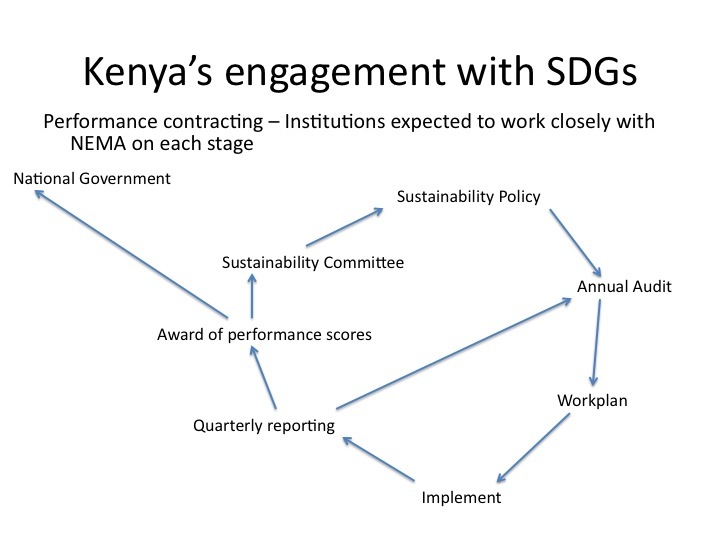 Figure 1 summarizes the process of engagement with public sector institutions in engaging on sustainability targets. Figure 1 shows that implementation of PC targets is systemic and proactive. It starts with the establishment of the Institutional Sustainability Committee who guide the entire process. The committee is expected to spearhead development of the Institutional Sustainability Policy, undertaking of annual sustainability audits, development of sustainability workplans and implementation of the same. In addition, the committee is expected to ensure quarterly progress reports are submitted to NEMA. NEMA in return reviews the reports and gives feedback to the institutions every quarter. At the end of each Financial year, NEMA assesses each institution’s quarterly submissions relative to the sustainability policy, annual audits and the annual workplan and awards a score to the institution. This score is forwarded to the Executive Office of the President as part of the overall national performance Contract Assessment and forms part of the basis for rewards and sanctions for the Chief Executive Officer and the Board of Directors for the particular institution. The National Environment Management Authority has provided a detailed explanation of the kind of activities that public institutions should engage with to promote environmental sustainability. Explanation of expectations from the 6 areas is as explained below. Any sustainability intervention needs to be planned for. Sustainability challenges are contextual and vary spatial-temporary. Institutions also are endowed differently and hence need to identify their sustainability challenges, prioritize them, including their interventions. Hence NEMA has elaborated implementation of environmental sustainability planning into several levels. Under this requirement, all institutions are expected to develop an institutional environmental sustainability policy which outlines the institution’s intent to address sustainability issues based on local contextual challenges. This document is expected to be developed by the institutional experts and to undergo relevant approvals such as by the Senior Management and the non-executive Board or Council as is appropriate. In case of Ministries, the Environmental Sustainability policy is expected to be approved by the Principal Secretary. The policy document and proof of relevant approvals is expected to be presented to NEMA as evidence of appropriate engagement of top management and hence assurance of buy in by the institutions. The appropriate approvals suggests that the policy has high probability of getting implemented. Each institution is expected to kick off environmental sustainability engagement by undertaking an audit to determine baselines of current sustainability position. Institutions are expected to identify sustainability issues relevant to them and determine the levels of diverse parameters. For instance on water issues, the institution will determine how much water is received and account for its use including any leakages. The same applies for energy, waste management, and transport among others. This audit is expected to illuminate gaps to be addressed to enhance sustainability. This audit is conducted every year to show progress towards sustainability. Every institution is expected to appoint a team to guide sustainability interventions. The team is expected to demonstrate diversity of competencies such as water audit, energy audit, waste audit, cost benefit analysis among others. The committee is expected to meet regularly to deliberate on implementation of sustainability interventions. NEMA requires the minutes of these meetings as evidence of proactive engagement. All public institutions in Kenya have a Citizen Service Charter. Inclusion of environmental conservation as a core value suggests the level of commitment by the institution to make sure that all staff are oriented towards sustainable development at all times. EMCA Cap 387 mandates NEMA to request for information from any institution for the purpose of preparation of State of Environment (SOE) reports and Environment Actions Plan (EAPs). The emphasis of this theme entails demonstrating compliance to different environmental regulations. Kenya has enacted numerous environmental regulations to promote sustainable development. (d)	NEMA shall, annually, report to the Council on the performance of functions under the Climate Change Act 2016, and such report shall form part of the report by the Council to the National Assembly. 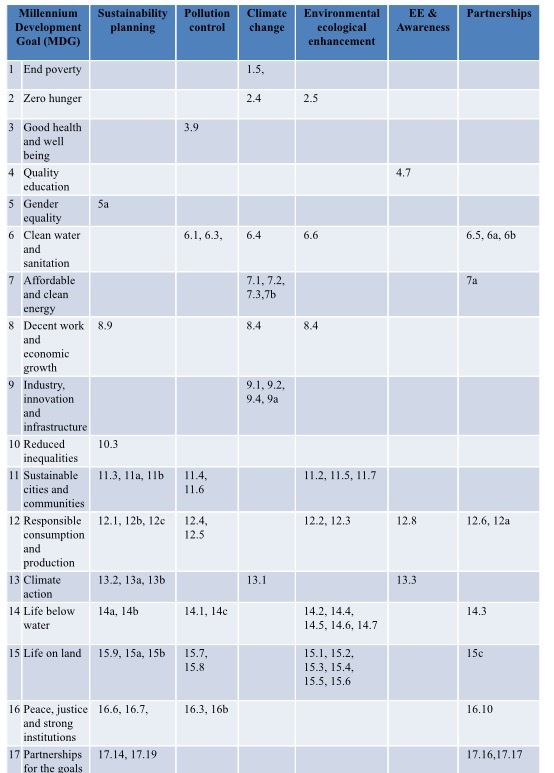 The coverage of SDGs through the sustainability targets is as shown in Table 1 below. Table 1 shows that the NEMA managed Sustainability Targets for Public Institutions covers all the 17 SDGs. Hence NEMA as an institution is on the forefront in championing for SDGs in Kenya through the Mandatory PC Sustainability Targets. The process of engagement of the public institutions ensures that there is proactive engagement and consistent guidance by NEMA to ensure upscaling of realization of SDGs. An RCE is not a center in a traditional sense but a network of existing formal, non-formal and informal education organizations, mobilized to deliver education for sustainable development (ESD) to local and regional communities (UNU, 2002). RCEs aspire to achieve the aspirations of Sustainable Development by translating its global objectives into the context of the local communities in which they operate. An RCE involves diverse stakeholders including school teachers, professors at higher education institutions, environmental NGOs, scientists, researchers, museums, zoos, botanical gardens, local government officials, representatives of local enterprises, volunteers, media, civic associations or individuals who work in the spheres of sustainable development such as economic growth, social development, and environmental protection, students and learners at all levels (UNU, 2002). Kenyan RCEs are hosted in universities most of which are players in performance contracting arrangement of the Central Government. NEMA coordinates the activities of RCEs in Kenya and helps to bring institutions together to establish an RCE. Kenya currently has 9 RCEs acknowledged by the United Nations University (UNU). These RCEs operate in different regions of the country. The list of Kenyan RCEs is provided below. Further, these 9 RCEs have established a National Network dubbed “Kenya National Network of RCEs” and have their own governance system including elected leaders. The coordinators of the network hold a meeting every year and a national conference where innovations from diverse RCEs are shared with members of the public. NEMA also assists each RCE to hold mobilization meetings to recruit more members, share experiences and to plan together. RCEs create a local/regional knowledge base to support ESD actors, and promote four major goals of ESD in a resource-effective manner. They can champion ESD programs tailored to address SDG issues and local context of the community in which they operate. Universities being hosts, coordinators and key members of RCEs, must work closely with the local communities. RCEs also play a role in increasing access to quality education that is most needed in the regional context as well as deliver trainers’ training programs especially on SDGs. This also entail development of methodologies and SDG learning materials for use by the trainers. RCEs should also lead advocacy and awareness raising efforts to raise public awareness about the importance of SDGs and essential role of ESD in achieving a sustainable future. This will promote the long-term goals of ESD such as environmental stewardship, social justice, and improvement of the quality of life (UNU, 2002). An RCE is characterized by a well-defined system of governance and management with an emphasis on enhancing collaborative partnerships and an inclusion of a research component in its activities. The four issues of governance, collaboration, research and development and transformative education are the core elements of RCEs and the way they are addressed determines the success of RCEs contribution to promotion of SDGs. Republic of Kenya (2016) Guidance for preparing the 13th Cycle (FY 2016/2017)Performance Contracts. The Presidency, Nairobi. That’s very informative piece on SDGs. This is the way to go. Let us implement the goals and we will reap big. ← What next for climate change?